Hi guys! Hope you had a lovely holiday weekend! We are officially “in mode” here at Casa Silver, and I wanted to kick things off with this fun post. As these crazy few weeks descend upon us, I find it helpful to have a few “back pocket” recipes to quickly and easily turn out snacks and desserts for impromptu invites and guests. There’s already so much to do to get ready for the holiday – and in my case the addition of tons more baking and cooking – that I rely on my fave shortcut ingredients for moments that need a little something extra with minimal fuss. And much like my go-to refrigerator biscuits and phyllo dough, you’ll rarely find me without a stash of wonton wrappers at the ready. 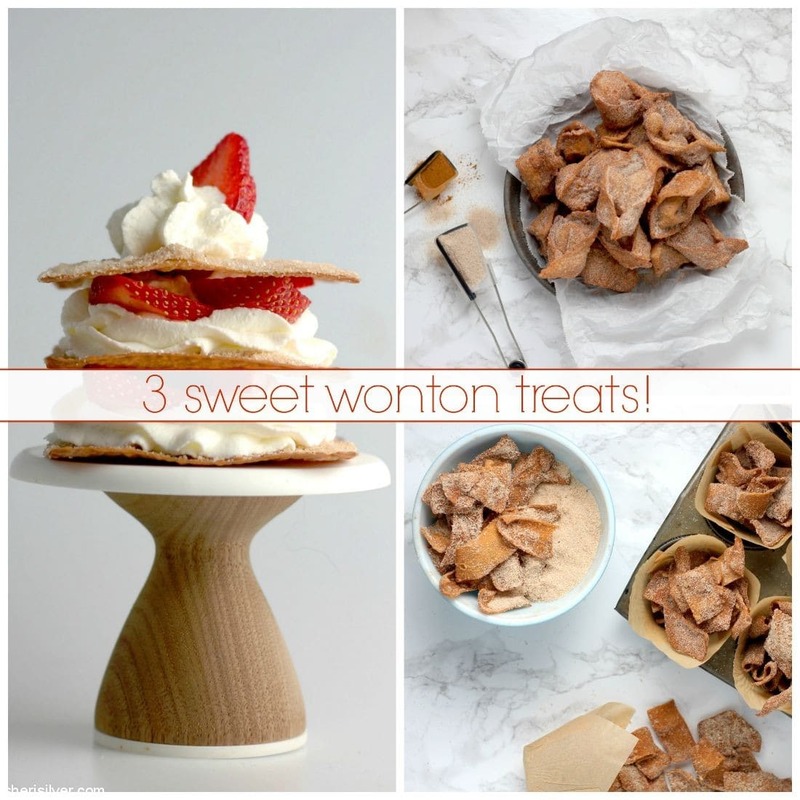 You might think of wonton wrappers for savory items such as dumplings, ravioli, and – well – wontons, but I love them equally for sweet treats. 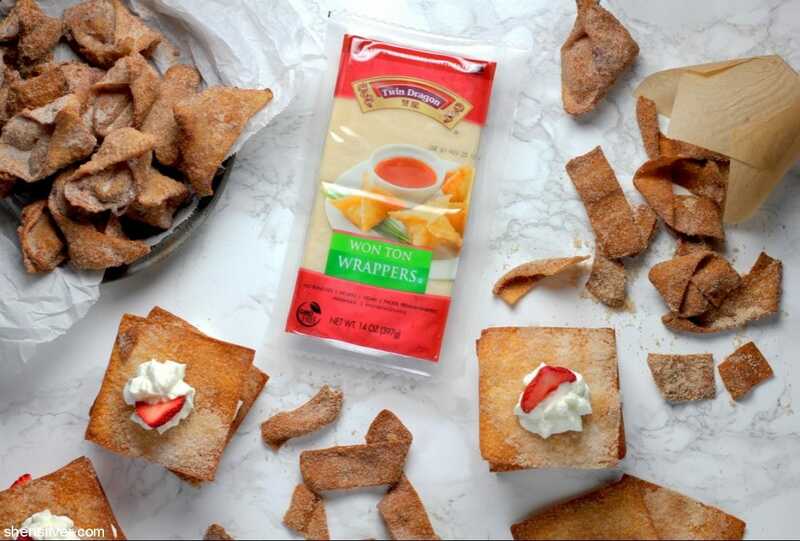 Twin Dragon wonton wrappers make whipping up delicious and unique snacks and desserts easy as 1-2-3. I made all three of these recipes in an afternoon, and everyone devoured them. Better still? They’re all do-ahead and super adaptable, so you can use whatever you have on-hand. 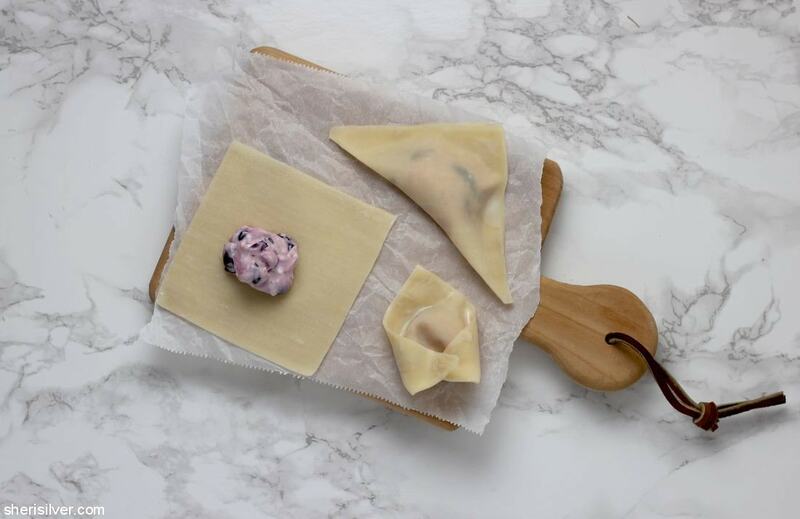 I started with these blueberry-cream cheese dumplings! Simply mix some softened cream cheese with blueberries (fresh or frozen) and a bit of sugar and vanilla. Place a teaspoon of the mixture in the center of a wonton wrapper, wet the edges and seal as shown. After a quick fry in hot oil, roll in cinnamon-sugar and serve. So easy! Needless to say you could use whatever fruit you have on-hand, and swap the cream cheese for a vegan version, marscapone or even ricotta. Next up? These ADDICTIVE crisps. I envisioned serving these with ice cream but they did not stick around long enough. Again, super simple. Stack the wrappers and cut into fourths. Fry in batches in hot oil and toss in cinnamon sugar. And if you need a quick and easy yet kind of fancy dessert you will not go wrong with these napoleons. Adorable, right? I love the individual servings and these are so customizable. Use any fruit, flavor the whipped cream if you fancy, and top the wonton wrappers with anything you like – chopped nuts, sprinkles, or pretty sanding sugars. You can purchase JSL Foods Twin Dragon products at: Albertsons, Shaw’s, Von’s, Stater Bros, Lucky’s, Food Maxx, Fred Meyer, QFC, Cub Foods, Rainbow Foods, Safeway, Associated Stores, Price Rite, Shop Rite, Winco, Price Chopper and Gelson’s – and of course follow them on Facebook and Twitter too. Line a baking sheet with a few layers of paper towels; set aside. Heat 2″ of vegetable oil in a large pot to 350 degrees. 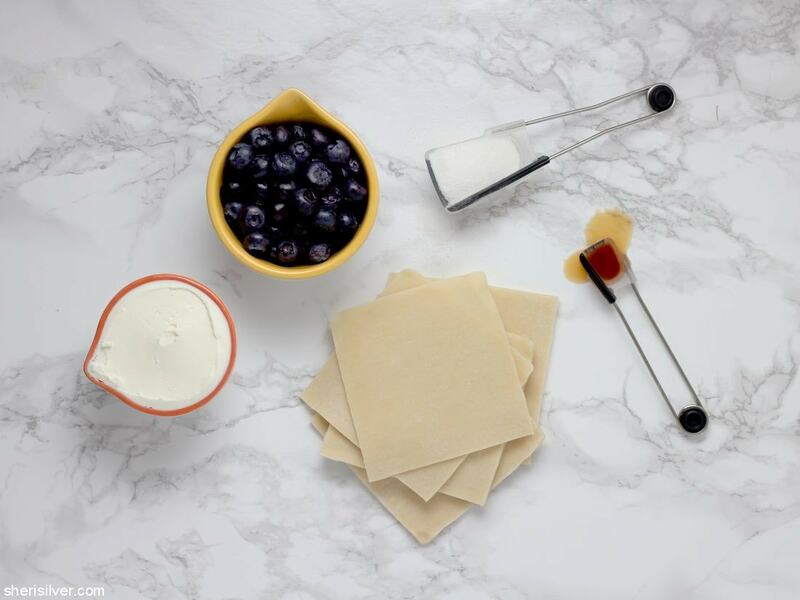 While the oil is heating up, mix the cream cheese, blueberries, 3 tablespoons of sugar and vanilla in a small bowl. Divide the mixture evenly among the wonton wrappers (about a teaspoon each). Wet the edges of the wrappers with a bit of water and fold in half to form a triangle. Press to seal. Bring the two long points to meet and press to seal again. Mix the remaining 1/3 cup sugar and the cinnamon in a medium bowl. Working with a few dumplings at a time, fry in the oil, turning to brown evenly. Use a slotted spoon to transfer to your prepared baking sheet. 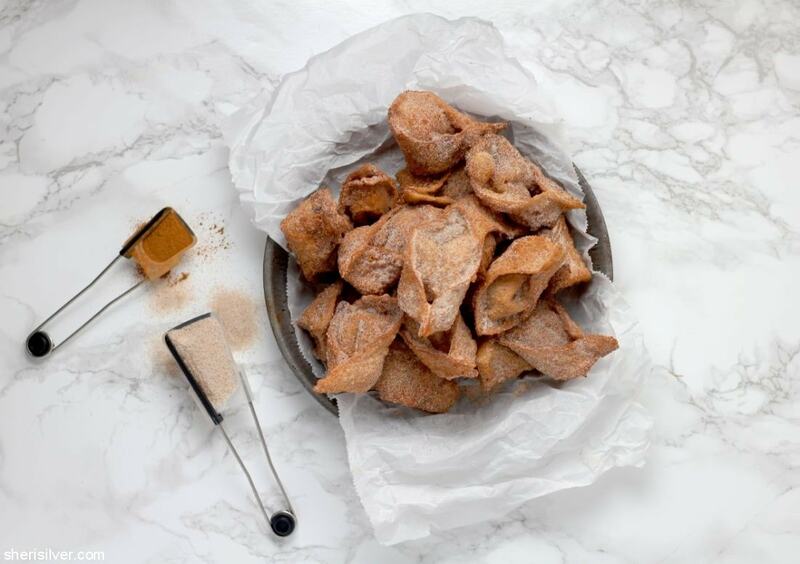 When the dumplings are cool enough to handle, place in your cinnamon-sugar and toss to coat. Serve immediately. Line a baking sheet with a few layers of paper towels; set aside. Heat 2″ of vegetable oil in a large pot to 350 degrees. Mix the sugar and cinnamon in a medium bowl. While the oil is heating cut the wonton wrappers into fourths (you can stack a bunch at a time, which will make this task go quickly). Working with a handful of strips at a time, place into the hot oil and fry till golden brown, turning once or twice. Use a slotted spoon to transfer to your prepared baking sheet. 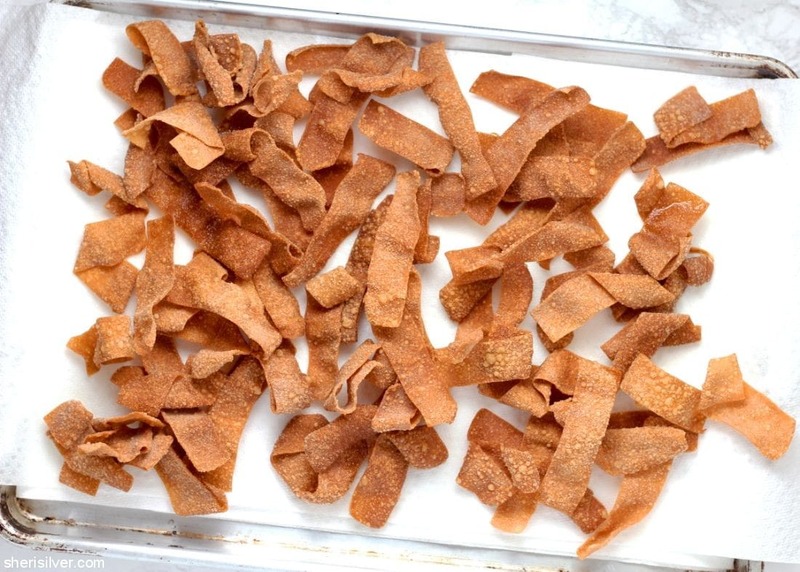 When the strips are cool enough to handle place in your cinnamon sugar and toss to coat. Store in an airtight container at room temperature. 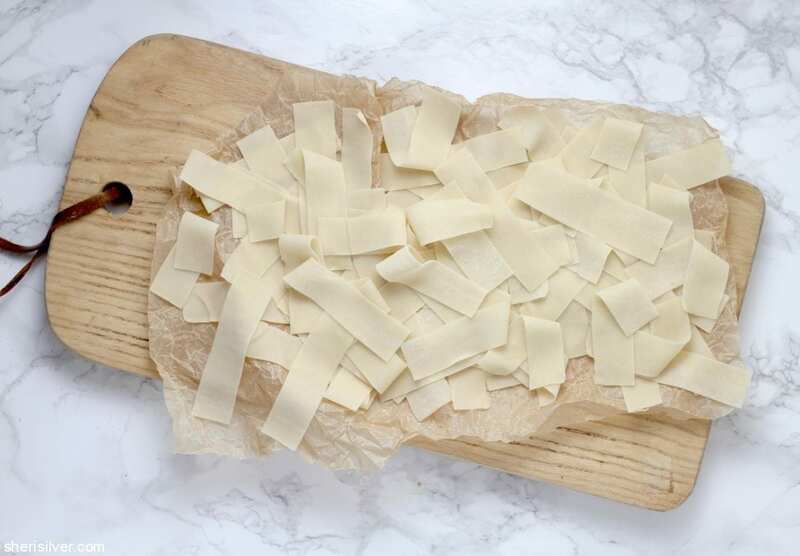 Pre-heat oven to 400 degrees; place the wonton wrappers evenly on a baking sheet lined with parchment paper. In a small bowl mix 2 tablespoons of the sugar with the cinnamon. 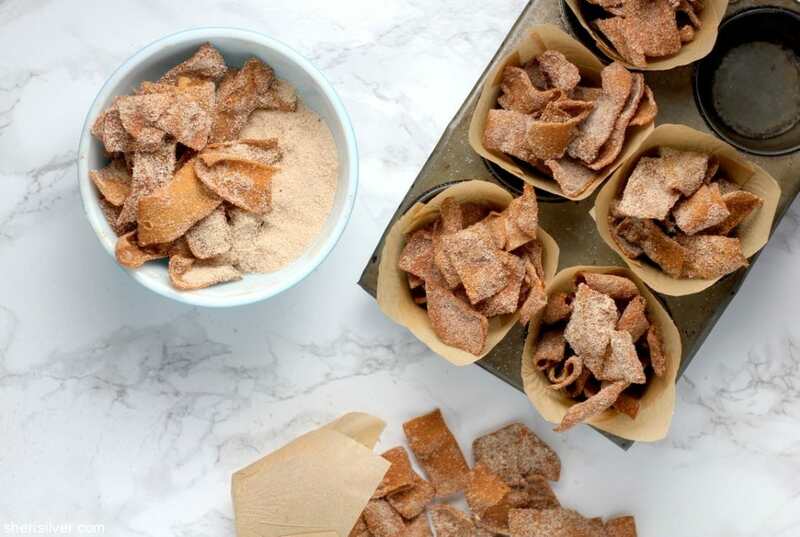 Brush the wonton wrappers with the melted butter and sprinkle with the cinnamon-sugar. Bake for 7 – 10 minutes or till golden brown. Let cool completely (this can be done up to 3 days in advance; store wrappers in an airtight container at room temperature). Just before serving whip the heavy cream with the remaining tablespoon of sugar till soft peaks form. Spoon or pipe some of the whipped cream atop 4 of the wonton wrappers. Top with a few of the sliced strawberries. 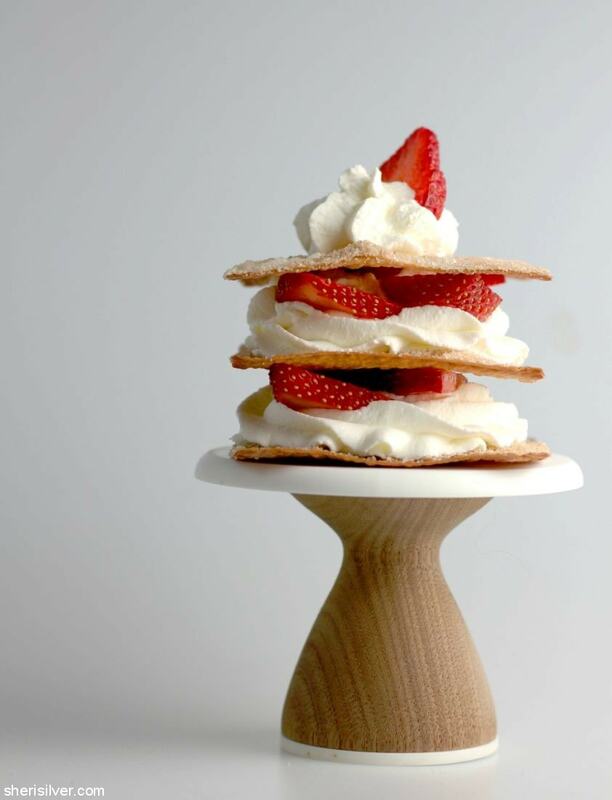 Repeat with another layer of wonton wrappers, whipped cream and strawberries. 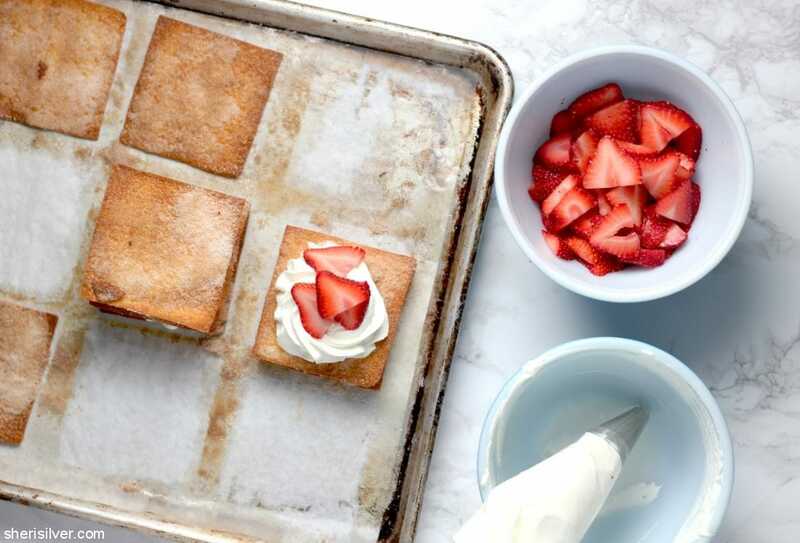 Finish with a wonton wrapper, topping with any leftover whipped cream and strawberries. Serve immediately. Note: I was not compensated for this post. This recipe has been entered into a contest sponsored by JSL Foods, who sent me samples of their products to use. All thoughts and comments are, as always, completely my own.